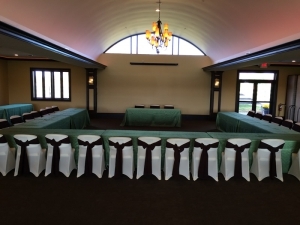 The Derby Banquet Hall & Conference Center is located on the property at Windy Knoll Golf Club. Our scenic location is just off of Route 68, on the North end of Springfield. There is no other location like this in the area, and it’s the perfect setting for wedding events, corporate events, family gatherings and school functions. The Derby, along with the Golf Course, The Stables and our other facilities, is open to the public.